Could there be a better ease into chilly mornings or overcast days than a day or even a whole week dedicated to chocolate? We’re struggling to find anything better. In case you’re looking for an opportunity to indulge – National Chocolate Week falls in October #chocolateweek and National Chocolate Day lands in July (you may or may not need to keep your stash in the fridge for this one) #nationalchocolateday. Now let’s be clear. We like chocolate. But it’s still a treat for us. So when we do indulge we like to think that we do it in style. And what better opportunity in the year than this to share our favourite chocolate haunts around the UK. We don’t do this lightly though; these are extra special chocolate treats we’re talking about here. There are more chocolatiers than you think dotted around the UK. Some are the perfect gift shops where you’ll find the ultimate thank you gift or special birthday present. Others are chocolate cafes, dedicated to serving the purest, chocolatiest chocolate drinks. And then there are the purely online shops for every chocolatey whim. We’ve stuck with the chocolate-on-the-street variety, so you can find these gems on your next cottage holiday. Now, if you’ve read Joanne Harris’ Chocolat, you’ll have an idea of the kind of magic we’re talking about. Chocolate that makes you stop still while you make sense of the sensory explosion in your mouth. 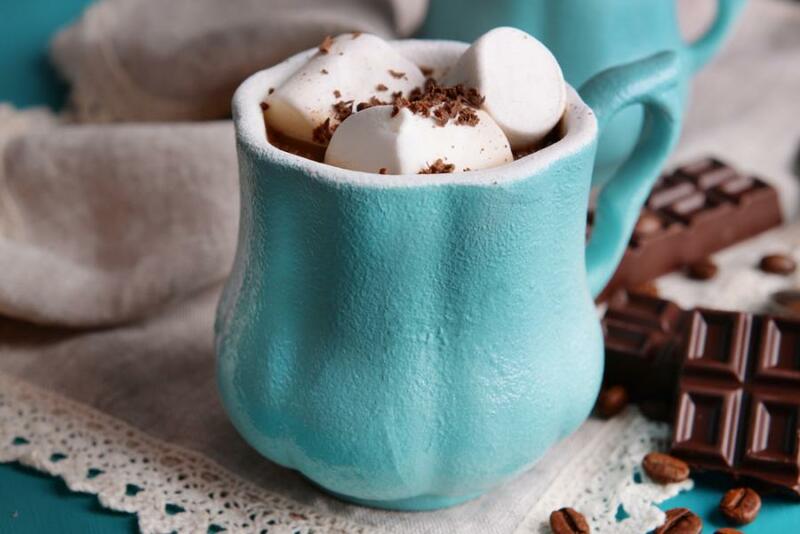 Sweet, rich elixir that turns out to be the richest hot chocolate. Chocolate sauce that requires only the finest Madagascan vanilla ice cream to escalate its yumminess even further into the stratosphere. So wherever you are in Britain this week (or any other week of the year – this is just a week of obsession celebration), we hope you find your way to one our favourite chocolatiers. There might even be one on your (residential or holiday) doorstep. We’re starting at the south and working our way up and across the country on this one. And there are few better places to start than Chocolate Apothecary in Ryde on the Isle of Wight. Perfectly positioned on Ryde Esplanade, you’d be a fool to miss it and even more of one not to pop in. In fact, the scent of chocolate that fills the air as you wander past acts more like a magnet. They make their own slabs of chocolate. Their fruit and nut is like no other, visually and taste wise. And their surprise slab of delight is 75% cocoa with violets – go on, try it. They have seasonal specials too that’ll woo you into pulling up a stool and passing the time of day over chocolate. These people are smart. Their #chocolateweek special is none other than Cioccolata Calda – that’s Italian hot chocolate to you and me (yes, rather confusingly ‘calda’ in Italian means hot). It’s intense. It’s rich. So savour every sip, because just like the finest espresso, it’s short but packs a punch. This gem is a genuine Cornish success story. A family business that has such a following it has recently moved from the family farm to a new factory complete with visitor centre and café. So not only to do you get to watch the chocolate being made, you get to eat it, take it away, buy it as a gift and drink it. What’s not to like. This is artisan quality chocolate in the furthest reaches of our beautiful country. Sustainably and ethically sourcing their cocoa beans is of paramount importance to them. Yet a bar from Kernow’s extension range will set you back as little as £2.50. Now prepare to put your tastebuds to the test. Somehow they manage to cram all the scrumminess of your grandma’s apple crumble into one of their bars. But fear not, there’s fabulous plain milk chocolate too. In true Cornish style, other Cornish businesses have backed Kernow’s growth. You’ll recognise their nostalgic packaging in the gift shops of many Cornish attractions including Saint Michael’s Mount, Truro Cathedral and The Lost Gardens of Heligan. So if you can’t make it to the café in St Eval, you know where to look while you’re out and about. It shouldn’t come as a surprise that the English Riviera is home to a luxury handmade chocolate company. It’s the perfect showcase for great British businesses. And this one’s got a great story behind it too. The Cockington Chocolate was inspired by chocolatiers in the south of France one holiday and next thing you know a partnership was born. One half of this partnership just happens to be an award winning chef, so you’ll find everything from hand decorated truffles to chocolate covered wedding cakes. If you’re holidaying in the area, this is a great rainy day spot – sign yourself up for a truffle making course and watch the rest of the family devour your own made treats (or just take a couple back to the cottage to share – we won’t tell). Or rest your weary legs in their tea rooms at Cockington Court while you test a truffle or two. They’re known to supply local accommodation providers as well. So if you’re lucky you might even find a taster of their chocolate waiting for you upon arrival! This café is spreading its wings up and down the River Thames with premises in both Windsor and Henley, but it’s the latter that we know best. Perched on the edge of Henley, overlooking the river and conveniently en route to the train station, the exterior is deceptively un-chic and un-chocolatey. But don’t be fooled, this modest looking café is brimming with chocolate delights (and everything else you’d expect of a satisfying café). You’ll be delighted to know that the potent liquid chocolate that’s the base of your hot chocolate comes from the very same chocolate that is used to make their divine cakes. Oh yes! Roy is a Master Patissier and Chocolatier, so he sure knows a thing or two about tempering. If you don’t know what tempering is, you haven’t watched enough semi final episodes of Great British Bake Off. Now down to the serious stuff: The Chocolate Café’s menu lists 21 hot chocolate options with an additional three liqueur versions, not to mention the child-friendly ‘baby chino’. Naturally you’ll find a white chocolate version and a chilli version. There are plenty of options for adding whipped cream and marshmallows too. But the one that’s got us hooked is the double strength hot chocolate and on a particularly cold day the ultimate hot chocolate (double strength base with whipped cream and chocolate flakes). And if pure chocolate elixir is what you’re after, hidden in the middle of the list is ‘Tiny extra thick Italian hot chocolate’ – we’ll see you there. This is a draw for cyclists and ramblers in search of mid excursion carbo-loading. Amidst green dales and hillocks you’ll find towers of whipped cream and marshmallows for that quick sugar hit. Decoration aside The Chocolate Shop is all about the cocoa bean. Whether you want a caffeine kick to get you on your way or the comfort of a hot chocolate you won’t be disappointed here. In fact, they’re convinced that the bean is part of your five a day. This is the bish, bash, bosh of chocolatiers in the north of England. Try as you may just to pop by and watch the chocolate being made. But see how long that lasts. Here you can watch it being made, make it yourself, eat it, drink it and buy it to give to others (if you must). And if temptation is just too much for you, you can resort to a gift voucher so you don’t eat your gift on the way home. York Cocoa House is home to the chocolate afternoon tea, oh yes. But don’t go a-wandering just because you’ve got a savoury tooth – come back for Chocolate Supper for savoury dishes all made with chocolate. That’s not a dare by the way; it’s a popular dining experience. Here they think inside and outside the chocolate box. From the traditional truffle to the savoury suppers via their range of hot chocolate options they quite rightly call this place an emporium. It should come with a warning though: you could be in here a while. York’s oldest chocolatier housed in a crooked looking building in The Shambles, one of York’s most famous streets. Everything here is handmade on the premises. What we loved, was the apparent love and attention dedicated to chocolate making and serving a quality product to a happy customer. You’ll struggle to stay away once you’ve been in. The chocolates were pretty good too, though with so many to choose from we could have stayed all day wading our way through truffles and pralines. Monk Bar is happy families, chocolate style. What’s more they’ve branched into ice cream making and you won’t be disappointed (they make Jammie Dodger flavour!). Also known for their chocolate sculptures beware the ghoulish Halloween themes currently gracing the shop interior! Proud to make all their chocolate fresh from the bean, this is a beautiful shop and café selling divine morsels of chocolate heaven. Yes, you can buy their flaked chocolate and follow the instructions to make it at home, but it really is most sublime when made for you on the premises. The magic in the flavour is partly in not really knowing how they make it so yummy – things always taste better when made by someone else, don’t they. While you might struggle to find a wine tasting tour while on your Edinburgh city break, you won’t be disappointed to replace it with the chocolate tasting on offer at the Chocolate Tree. A bit like learning about the different Scottish whisky origins, you’ll put your senses through their paces and discover a whole new love for chocolate (however much of a Cadbury stalwart you are). However you like to consume chocolate, you’ll be hard pressed to leave here without something to satisfy your cravings. Choose from individual, hand crafted chocolates, homemade bean to bar slabs and their decadent chocolate spread (shhh!). We’ve by no means exhausted our country’s chocolate obsession. But we’ve shared our current highlights and hope you find them on your next holiday, whether you wander to the south west or the Scottish capital. Share your own favourites with us too and we’ll doubtless celebrate some more of the country’s chocolatiers as we come across them. Now, if you haven’t already split the KitKat or ripped open the Green & Blacks, what are you waiting for? !